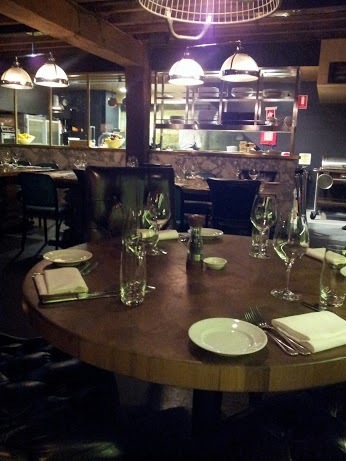 The Cut Bar and Grill is an upmarket dining experience for steak connoisseurs. I had previously dined there a year ago, and my pleasant experience, as well as the delicious food was what brought me back a second time. 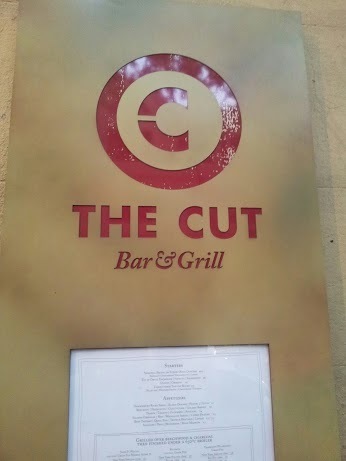 The Cut is located on Argyle Street in the Rocks, just off George Street. The Cut is housed in a historic stone building, with downward leading stairs at the entrance that lead you into a large dining room filled with wooden tables, dark furniture and brick walls. The dining room is stately but welcoming at the same time. My boyfriend and I were greeted by a smiling host who welcomed us in European accented English. After being shown to our table, our host promptly asked us if we would like any drinks, and then brought over the dining menus. The wall next to which we were sitting boasted an impressive display of a multitude of wine bottles. 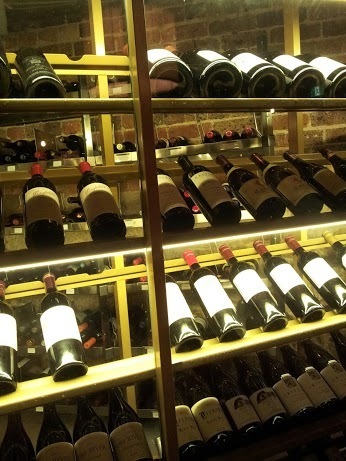 Although I didn't drink that evening, The Cut has an extensive wine list, making it the perfect destination for wine aficionados. I was also impressed with their choice in music. Too many times I've been to restaurants playing too-loud modern dance or pop music that detracts from what could have been a pleasant environment. At the Cut, they played classic big band, swing and jazz from the 1940's. It added a touch of nostalgia to the place, and made me feel like I had been transported back in time. It was a nice change from hearing modern music, and fitted in perfectly with the understated elegance of the restaurant. We didn't take long to order, and had our menu items taken down by a waiter. After that, a server came around to our table with offerings of complimentary white or brown bread with butter. We both selected a slice of brown, and were not disappointed. I always enjoy complimentary bread in restaurants, and this was no exception. Except to say I enjoyed it would have been an understatement. I absolutely loved it. I remarked to my boyfriend how good the bread was, and he agreed. It was slightly warm, soft and fresh. The texture was slightly firm without being stiff, and had the springy texture of bread that has been cooked well. It was perfection. If I could have, I would have paid for a lifetime's supply of that bread, and then eat it every day for the rest of my life. 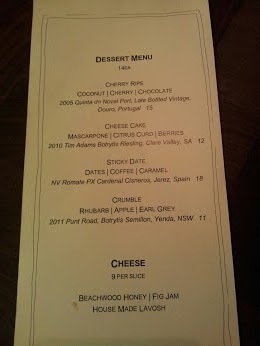 Menu offerings at The Cut. There's much to enjoy for meat lovers, but very limited options for vegetarians or vegans. I was surprised when our waiter returned no more than 10 minutes later with both of our entrees. We were extremely grateful for the speediness of the cooking time as we were extremely hungry. 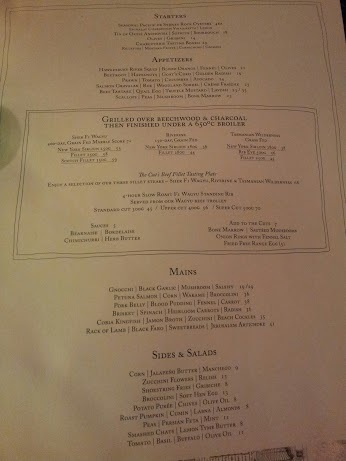 The two entrees that we immediately started digging into were the Scallops with Peas, Mushroom and Bone Marrow ($22) and Salmon Gravalax with Roe, Woodland Sorrel and Crème Fraiche ($23). Entree of Scallops, Peas, Mushroom and Bone Marrow. The scallops were seared at just the right amount to bring out a wonderful flavour. 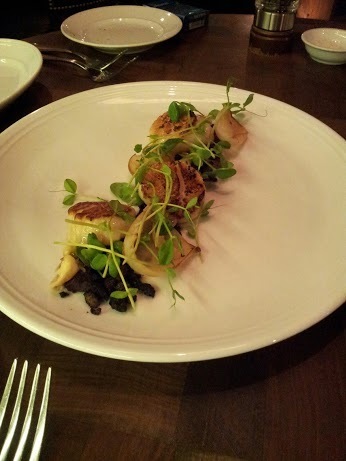 The mushrooms were small and blackened, and heightened the flavour of the scallops. The scallops and mushrooms worked well together, while the bone marrow added a certain 'je ne sais quoi' to the dish that brought it all together. The salmon gravalax was served cool. It was comprised of a few pieces of smoked salmon with fish roe, and garnished with sorrel amongst a lathering of crème fraiche. The salmon was fresh, and its characteristic smoky flavour mixed with the crème fraiche was a timeless and traditional combination; but one that pleased the tastebuds nonetheless. 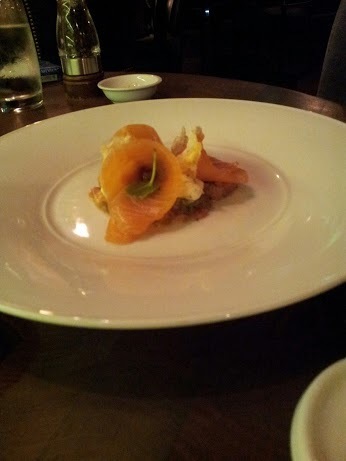 My boyfriend favoured the salmon gravalax over the scallops, while I preferred the scallops. Shortly after we had finished our entrees, a waiter came to take away our plates. It wasn't very long until he came back with our mains. Having our food come out quickly in a non-Asian restaurant was something I was new to. I haven't experienced many restaurants serving Western cuisine that are able to serve their dishes so quickly, and they deserve bonus points for it. The food was served rather quickly, but on the presentation and taste front, nothing had been compromised at all. That being said, the steaks we had ordered were rather plainly presented. 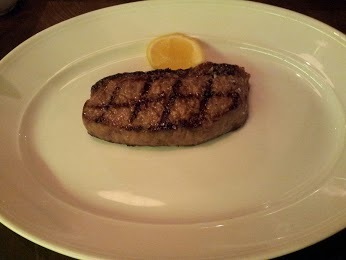 It was just meat on a plate, while my steak was accompanied by a small lemon wedge to use as a garnish. For our mains we had ordered 300g of the 4 Hour Slow Roast F1 Wagyu Standing Rib ($45) and a New York Sirloin of the Tasmanian Wilderness Grass Fed variety ($36). The 4 Hour Slow Roast F1 Wagyu Standing Rib is The Cut's signature dish, and also their most popular. The 4 Hour Slow Roast F1 Wagyu Standing Rib. Too good to miss out on. 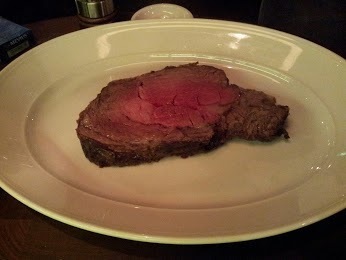 When being served, the waiter rolled over a large trolley, from which he cut the wagyu standing rib from. He then put it on a plate and presented it to us. Like many other Sydney restaurants that specialise in steaks, such as Black or Prime, The Cut serves just the bare essentials on a plate. Separate sides are available for an additional price. 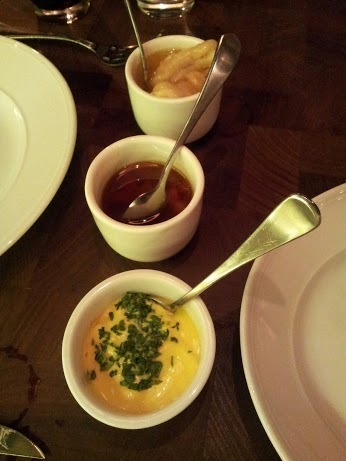 In addition to our main courses, we also had the Potato Puree ($8), the Bone Marrow ($7) with Chimichurri ($5), and Béarnaise ($5) as dipping sauces. Due to its cooking method, the Wagyu Standing Rib is unable to be cooked to everyone's liking. It is cooked until it is about medium rare, judging from its reddish pink colour. It is a cut of meat so tender that it practically melts in your mouth. The fattiness of the meat also gave it a deliciously juicy flavour. The chimichurri was my boyfriend's favourite sauce. It is an Argentinian sauce that is usually eaten with meat, and contains parsley, olive oil, chilli peppers and garlic. I liked the spiciness of the chimichurri, but preferred the béarnaise sauce for my own steak. The New York Sirloin was very different to the Wagyu Standing Rib. My boyfriend noted that the two dishes were not at all similar in taste. The new york sirloin was more like a traditional steak in taste, texture and look. I had asked the waiter to have it cooked to medium rare, and it came out just so. It was full of flavour, and tender; but was not as soft as the wagyu standing rib. The creamy béarnaise sauce was also a perfect combination for the new york sirloin. The béarnaise was topped with a sprinkling of herbs, and was smooth and buttery, yet not too heavy on the stomach either. When it comes to food, I like to keep things interesting by trying new or unusual things. From top to bottom: Bone Marrow, Chimichurri and Béarnaise. When I saw bone marrow on the menu at The Cut, I was excited that I would be able to add another strange animal part to the list of foods I'd eaten. When trying strange cuts of meat, I kept an open mind. Generally, it's more for the experience of eating something uncommon rather than for enjoyment purposes. However, when I first tasted the bone marrow, I knew it was something that I would want to eat over and over again. It was impossibly creamy and soft, and served with some kind of oily but delicious sauce that I drizzled on the potato puree. I couldn't get enough of it, and my only complaint was that the serving was too small for my voracious appetite. The potato puree on its own was average. 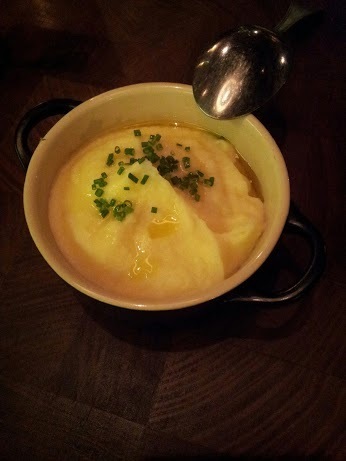 It was the quintessential mashed potato: creamy, smooth and warm. It was good, but much more tasty after I'd drizzled the sauce from the bone marrow on it. With the excellent quality of the main courses and sides, we finished every bite with unrestrained enthusiasm. The waiter took away our plates soon after we had finished, and then brought us the dessert menus. Within a few minutes we had made our choices and had returned the menus to the waiter, only to have him return within minutes with our desserts of choice. 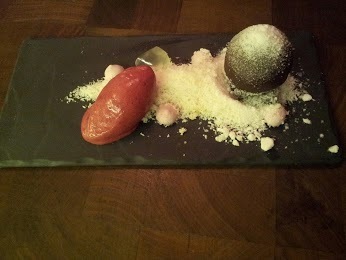 I had picked Cherry Ripe ($14) simply described on the menu as coconut, cherry and chocolate. When I was a child, cherry ripe was my favourite candy bar, and I loved to eat it on a daily basis. After seeing The Cut's dessert named after that special childhood love of mine, I knew it was something I couldn't go past. I was not disappointed in my choice, and in this instance, my expectations were exceeded. The Cut's version of Cherry Ripe was an aesthetically appealing arrangement of a dark chocolate sphere, a dollop of cherry sorbet, and generous sprinklings of dried coconut. After tapping the chocolate sphere a few times with my spoon, it cracked open to reveal a dark, creamy interior. I gathered some of the chocolate up with my spoon and combined it with the coconut and cherry sorbet. It was a version of the children's chocolate bar that had been reinvented for grown-ups. The flavours in this dessert could not have made a better union. The tart cherry, the dry and sweet coconut and the moist, bitter chocolate all complemented each other. It was a classic and simple dessert, and one that I enjoyed a lot. I hope that they will keep on the menu. Crumble with Rhubarb, Apple and Earl Grey. My boyfriend had the Crumble with Rhubarb, Apple and Earl Grey ($14) for dessert. It contained slices of rhubarb with biscuit crumble sprinkled over the top with apple reduced to thin paper-like pieces, and earl grey jelly. His dessert was more modern than mine. 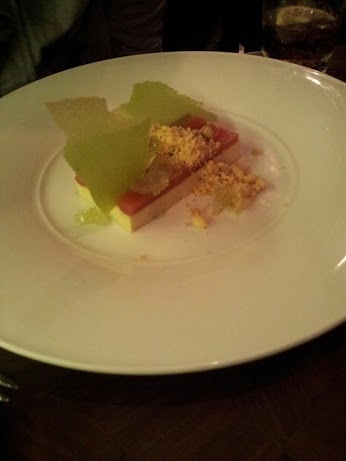 The rhubarb was sweet, and contrasted with the textures of the biscuit crumble, apple, and earl grey jelly. 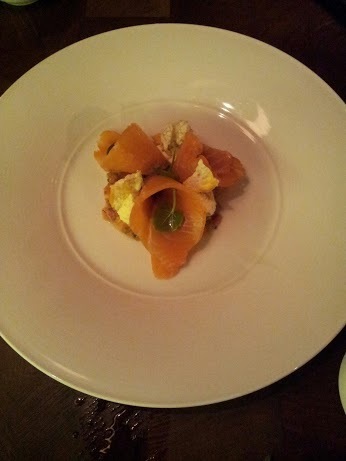 As well as excellent food, the service at The Cut was second to none. All the attendants that had served us that evening did so with a smile and amiability. Another positive aspect of my dining experience at The Cut was the exceptional speed of the chefs. All our courses that evening had been served to us quickly after we'd ordered, and I appreciated it. We arrived for a 6pm dinner and finished just a little over an hour later. When we arrived, we were the first people in the restaurant and watched it fill up as our meal progressed. It didn't become too much louder though, which was another point I was also thankful for, as I particularly dislike noisy restaurants. There aren't many occasions on which I dine out and have a really memorable experience, but this was definitely the case at The Cut. I was surprised to have my expectations not only met, but exceeded, and am pleased to say that I have found another rare dining establishment of distinction. Why: For the premium quality steaks and extensive wine list. 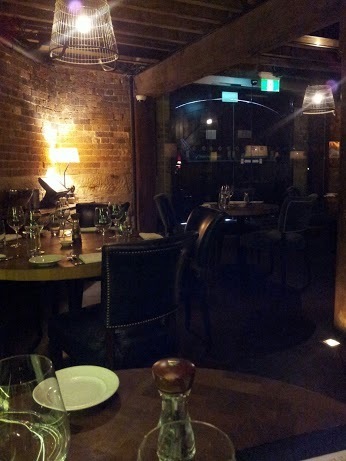 Cost: Entrees start at $14, mains from $29-$70 and desserts are all $14.